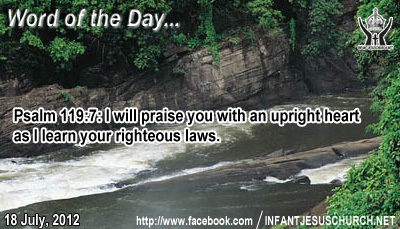 Psalm 119:7: I will praise you with an upright heart as I learn your righteous laws. Heavenly Father, we want to be more like you in character even though we will never be like you in power or majesty. Open our eyes and through the Spirit enlighten us as we seek your will in your Scriptures and as we seek to be obedient in our daily life. Forgive us our sins and create a clean and holy heart, wholly determined to do your will. In Infant Jesus' name we pray. Amen. Jesus contrasts intellectual arrogance with child-like simplicity and humbleness. The simple of heart are like "babes" in the sense that they see merely without pretense and acknowledge their confidence and trust in the one who is greater, wiser, and more dependable. They seek one thing – the "greatest good" who be the God himself. Humbleness of heart is wedded with simplicity, the queen of virtues, because humility predisposes the heart towards grace and truth. Just as pride is the origin of every sin and evil, so humility is the only soil in which the grace of God can take foundation. It alone takes the right approach before God and allows him as God to do all. God opposes the proud, but gives grace to the humble (Prov 3:34). Only the humble in heart can gets true wisdom and understanding of God and his ways. Do we submit to God's word with simple trust and humility?